Thanks for making my artist’s smock…feel more like a cape. So, I’m really struggling to select topics for this blog. My mind is so active as of late that it can be a challenge to stay focused. So much is happening around us…and in our industry. Julie and I are thrilled with the final visual outcome of the Studio & Market. Early customer reviews are extremely positive toward our small corner of the creative universe. Thanks to so many people who helped us put this together. And thank you to our valued customers and clients over the years who shaped our vision. My creative team feels at home in the new space, and I feel as though I’ve reached a kind of professional and personal “base-camp.” A place where I can plan for some glorious accent to an artistic peak I hope I NEVER reach. In the opening of this new venue, comes a sense of personal and professional accomplishment that feels a bit strange. A mental cocktail of equal parts artistic emotion, rational business strategy and mid-life rebirth. With the recent HGTV appearance, the radio show going to an hour and the new store…I feel like I’m living out loud…but not living loudly. The work is speaking for itself, breeding a tempered optimism that fits like a glove. Measured and empowering. Just another example of the molecular transformation that occurs as a result of any meaningful journey…that is often times more relevant than the arrival at the intended destination. Let’s be honest, I’m wired differently. I understand this, and have finally learned to embrace it rather than apologize for it. 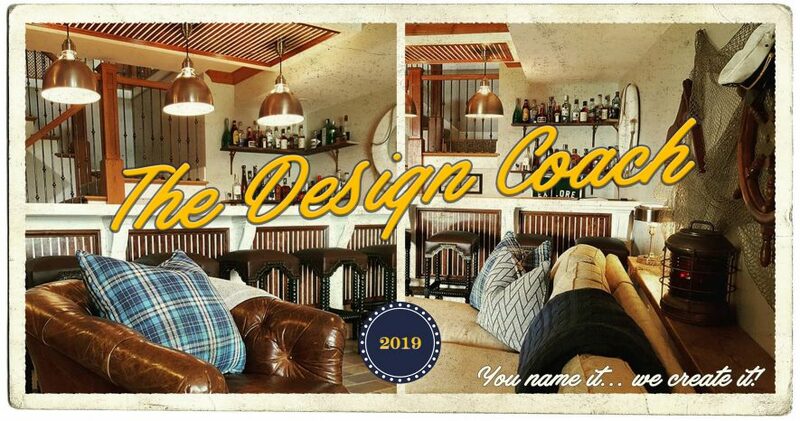 And increasingly, I’ve become obsessed by the prospect that a driving force behind The Design Coach is to encourage others to be brave in their design. Whether it be the design of a home, a room or a life. Too ambitious? Perhaps, but the tide of patrons and their reactions to our latest work tells me otherwise. From my new desk, there is no sound more satisfying then the audible gasp of a new customer as they walk in the front door. Nothing more gratifying than seeing them stop in the welcoming sea grass entry, as they gaze and attempt to take it all in. And although this special space is small by the standards of today’s commercial cathedrals to design…it’s packed with love, substance, style and our collective passion for sharing great ideas. As I write this blog entry, and engage with visitors the exchanges are both humbling and exciting. “I walk around and I just can’t stop smiling.” one customer whispered in my direction, as though it was our little secret. Yet another shared, “Your store reminds me of a happier time in my life. I don’t want to leave.” What do even say to that?! Then there are the customers who know us from our previous venues in Chicago and other locations…their responses often include comments like “We’re so glad we found you!” and “We couldn’t wait for you to open.” All the while, they have no idea that every sincere and positive encounter encourages us to continue this creative journey. In the design of this space in particular, I intently applied the advice I often give my clients. Design from your mind, decorate from your heart. And it’s already paying off in ways I couldn’t possibly have imagined. As I have said time and time again, two things NEVER seem to go out of style. Personality and risk. Personality in an interior has the ability to invite you in and tell a special story without speaking a word. Rooms without a personality are typically forgettable…and what’s the use in that!? In my world, risk and visual surprise in an interior is absolutely essential. Both exciting and polarizing…I actually prefer the right mix of both in the interiors I design, the one’s I visit and my own. The only real question we should be asking ourselves when introducing “riskier” elements into our design is “What’s the right percentage?” Seriously, no joke, some of us are drowning in a sea of accessories who’s brand name ought to be Yawner, and copy-cat interiors resembling the performance of a mime, rather than that of an accomplished artist. The myth is that money guarantees interesting interiors, and lives for that matter…it doesn’t. The shame is that some of us have just stopped trying because we think beautiful means expensive. I’m here to tell you with the right coaching and inspiration, EVERY interior, regardless of the budget can be beautiful…as long as it has a sense of purpose and possesses the visual anticipation of a parade. And as I sign off on the last paragraph of this blog entry I hear another great comment. “I love this place…they always have the best ideas.” I respond by saying “So kind of you to say. Thank you, and please come back soon.” Interactions like that mean SO much to independent business owners. Please remember that. Kindness and commerce CAN coexist. And it can be contagious if we’re all willing to be infected. As for me, encounters like those I had today seem to turn my studio smock into a Design Coach cape. I feel creatively bullet-proof…like a design superhero. And all I can say is that if you want ideas…you’ve come to the right place. We’ll be serving them up all day…every day at our thought provoking Midwestern design saloon. Intoxicating and arguably therapeutic, there’s always an open seat at the bar…literally and digitally. Hope to see you again soon. can come from the smallest of places.